BestHorsePractices has more critically-praised and well-researched articles on wild horses than any other media outlet. Read the storied and complicated issue of wild horses and burros in the western United States. 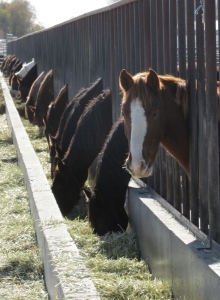 Horses at the BLM’s Delta, UT facility. Read report on current mustang crisis. Read review of National Academies of Sciences report on BLM policy. Read about a visit with Utah BLM leader and a trip to Delta, UT holding facility. Read about adopting a mustang. Read about adopting a burro. Read about the Impact of the Horse event. Read more about mustangs on NickerNews.